BOTHONG RUBBER FUND COOPERATIVE LTD.
SRI TRANG AGRO-INDUSTRY PUBLIC CO.,LTD. TAVORN RUBBER INDUSTRY (1982) CO.,LTD. THAI HUA RUBBER PUBLIC CO.,LTD. THAI RUBBER LATEX CORPORATION (THAILAND) PUBLIC CO.,LTD. 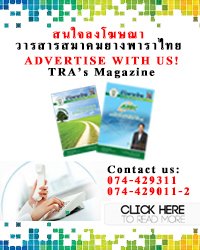 VON BUNDIT CHUMPHON CO., LTD.
ADVERTISEMENT ON WEBSITE / MAGAZINE... PLEASE CONTACT US. THANK YOU! 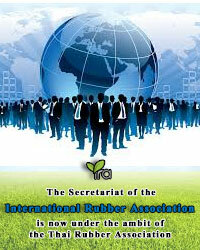 The International Rubber Association (IRA) was inaugurated in Ottawa, Canada on 24 September 1971 through the cooperation of rubber associations in both producing and consuming countries. 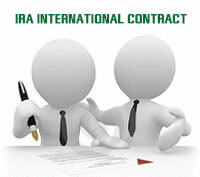 Currently, IRA consists of 20 members from 13 countries. 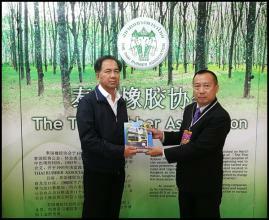 The Thai Rubber Association is one of the initial members and a member of the Management Committee. With the term of 2 years, IRA is led by 8-member Management Committee, 4 of which are member associations from producing countries while the other 4 are those from consuming countries. The objectives of IRA are to formulate rubber trade practices, to prepare international rubber contracts, to foster international cooperation on rubber production, trade and consumption among producing and consuming countries, to collectively solve any problems in connection with international rubber trade as well as to facilitate continued improvement in international rubber trade. The Secretariat office of IRA is currently located in the Gapkindo’s (Rubber Association of Indonesia) building. IRA convenes Management Committee meeting every year and Biennial General Meeting every 2 years. This year, both the meetings were held on 17 March 2019 at Marina Mandarin Hotel, Singapore. Among associations present were Malaysia Rubber Exchange (MRE), Gapkindo (Rubber Association of Indonesia), Singapore Exchange Ltd. (SGX SICOM), Rubber Trade Association of Singapore (RTAS), Singapore International Chamber of Commerce Rubber Association (SICCRA), Myanmar Rubber Planters & Producers Association (MRPPA), Rubber Trade Association of Europe (RTAE), the Japan Rubber Manufacturers’ Association (JRMA), and Wirtschaftsverband der deutschen Kautschukindustrie e.V. (German Rubber Association. In representation of TRA, Mr. Paul Sumade Lee (IRA Chairman), Mr. Supadetch Ongsakul (IRA Executive Secretary), Mr. Chumnarn Nopakunkajon (TRA Vice President), Ms. Piyaporn Saelim (TRA manager) and Mr. Prasit Petnoosed (TRA officer) participated in the meeting. In his opening remark, Mr. Paul Sumade Lee, IRA Chairman stated that the rubber industry was tough in 2018 partially due to the flooding of non-approved rubber or cup lump unexpectedly replacing the 3 approved origins of Thai, Indonesian and Malaysian rubber. In addition, according to the supply and demand statistics in 2018, it does not appear to have any sizeable oversupply causing the rubber price to trade as low as $1250 a ton. In truth, rubber price may have been driven more by speculators up and down, and not necessarily correlated to the fundamental demand strength or weakness. Among several important matters vastly discussed at the meeting were Proposed streamlining of the IRA Contract for TSR and Proposed amendments to the IRA Contract for Latex in Drums. The Committee adopted the amended TSR contract as proposed by ASEAN Rubber Business Council. The said contract will be effective on and after 1 June 2019. The Committee also decided that the current IRA Contract for Latex in Drums shall be updated in the near future. At the IRA Biennial General Meeting, members agreed that Gapkindo be elected as IRA Chairman and RTAE as IRA Deputy Chairman for the term 2019-2020. 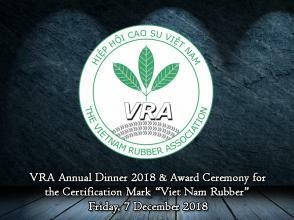 On behalf of the Thai Rubber Association, I wish to thank Mr. Paul Sumade Lee, IRA Chairman and Mr. Supadetch Ongsakul, IRA Executive Secretary as well as the Secretariat of TRA for the devotion and excellence witnessed over the past 6 years. I hope that IRA will always be an important part of the cooperation between producing and consuming countries for continued development of international rubber trade. According to the President of the Rubber Products Industry Group (Mr. Ekachai Limpichotipong), the meeting of the Rubber Products Industry Group Committee No. 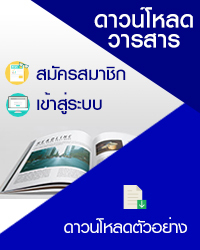 3/2019 on Thursday, March 28, 2019, from 15:00 to 17:00, at Meeting Room 1014, 10th Floor, Creative Technology Building FTI In this regard, M..
With the Thai National Shippers' Council scheduled to hold the Trade Environment Committee Meeting No. 3/2019 on Wednesday 27 March 2019 at 12.00-15.00 hrs. At Meeting Room 1, Thai National Shippers' Council, 32th Floor, Lumpini Tower, Rama 4 Road, Bangkok. In this regards, Ms. Piyaporn Saelim, TRA ..
Tuesday, March 26, 2019 - Mr.Supadetch Ongsakul TRA Deputy Secretary General was assigned by TRA President was invited by China Rubber Industry Association (CRIA) as speaker and present as "Thailand Sustainable Rubber Plan" in China Rubber Conference 2019 at Shangri-la hotel, Guangzhou, China. It wi..
With the Department of Agriculture scheduled a seminar on "The potential development of rubber manufacturers and the development of quality systems for rubber testing laboratories according to international standards ISO / IEC 17025" on Tuesday 26 March 2019 at 8:30 am.-4:30 pm. 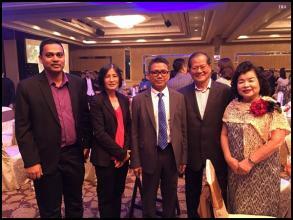 at Rama Gardens Hote..
Mr. Bundit Kerdvongbundit Secretary General, Mr. Supadetch Ongsakul TRA Deputy Secretary General Dr. Paitoon Wongsasutthikul TRA Deputy Secretary General and Ms.Piyaporn Saelim TRA Manager attended RTAS Lunar New Year Dinner 2019 on Friday, 22 February 2019 at Raffles City Conventio..
On Friday, 5 October 2018 [7.30 p.m. (Local Time)]- Malaysian Rubber Exchange (MRE) organize MRE Annual Dinner 2018 at Hotel Istana Kuala Lumpur, Kuala Lumpur, Malaysia. Mr. Krisada Boonrat, Minister of Agriculture and Cooperatives The president "Thailand Rubber Innovation Expo 2018", which was held at The 60th Anniversary of His Majesty the King's Accession to the Throne International Convention Center, Hat Yai, Songkhla Province on 14 - 16 September, 2018, un..
GAPKINDO will be held Gapkindo Gala Dinner 2018 on Friday, August 3, 2018, at the Grand Hyatt Hotel, Bali, Indonesia.